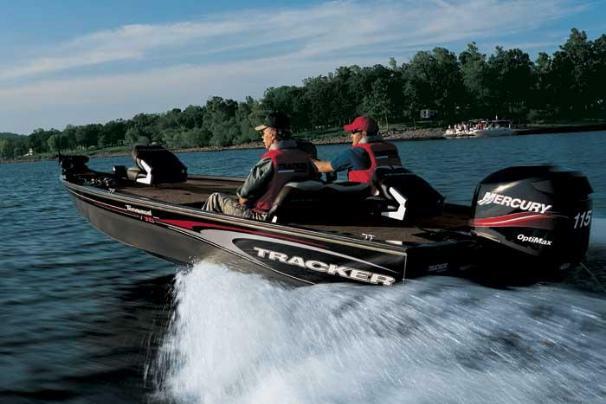 Boat Description For tournament-level fishing, the Tournament V-18 features a stable, high-performance Deep V hull and a traditional bass boat layout. The Deep V performance hull gives a smoother, more responsive ride to distant fishing holes. And its wide 87` beam and 69` bottom provide extra fishing stability, spacious fishing platforms and cavernous under-deck storage. This package is loaded with tournament and convenience features: Mercury Pro Series outboard, Lowrance X47 fish finder, MotorGuide foot-controlled trolling motor, large tournament-ready livewell, two extra-large rod lockers, drop-in tackle-boxes, onboard battery charger, 41-gallon fuel tank plus a custom trailer with GalvaShield protection, EZ lube hubs and swing-away tongue. Dry Weight 1152 lb approx.